» VeganMoFo: How do you ‘fu? Don’t Eat Off The Sidewalk! VeganMoFo: How do you ‘fu? As most vegan bloggers know, Isa has a new brunch book coming out and so a lot of us have been testing for it. 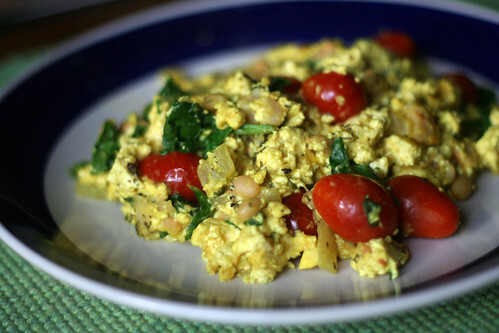 One of the recipes is a pesto tofu scramble which I loved, and I took from that my new favorite way to make tofu scramble. At the commissary they usually have organic basil, in a big bunch, for a pretty good price. Usually I can only find them in small packages and they’re so pricey. I take a whole sweet onion, roughly chop it, and cook it in olive oil over mediumish heat. I don’t usually wait for them to get completely caramelized, but I do let them get pretty soft. I stir them occasionally while getting everything else together. I add salt, pepper, a little bit of tumeirc and paprika for color. Wait about ten minutes for them to get softer. A couple of cloves of minced garlic. I roll up the basil leaves and chop them (I don’t really count, maybe 20 leaves?) and throw them in too. Let those things rock out together for a few more minutes and then add my lightly pressed crumbled tofu. Stir it all to coat and then I let it alone except for the occasional stir for about fifteen minutes. 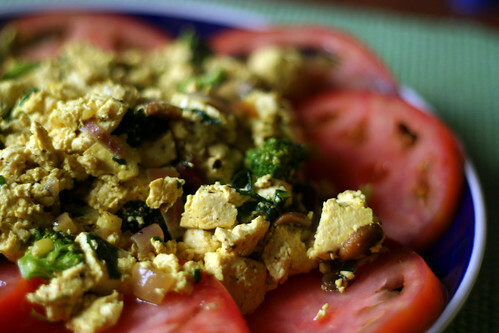 I like some of the tofu to get a little brown. While that’s happening, I slice a tomato and arrange the slices on a plate. Then when it’s ready, I put my scramble on top of the tomatoes so it warms them up a bit, because sometimes I don’t want cooked tomatoes but I don’t want them to be super cold either. Now that tomatoes and basil are on their way out i’m going to have to switch to dried basil (not nearly as tasty) and nix the tomatoes, but I still think it’s pretty good. I really like onions, if I have mushrooms or spinach that needs to be used those can go in too. One time I did want cooked tomatoes so I put cherry tomatoes in there and white beans because apparently I really wanted protein.